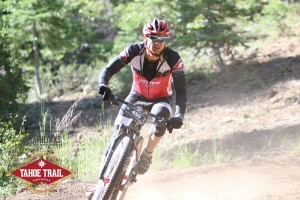 The Lake Tahoe Trail 100K is a mountain bike race that starts and finishes at Northstar Ski Resort and consists of two loops. Although 100K (actually 64 miles) is a much longer race than I have any desire to do, I gave in to the pressures being put on by my friend Ken Mejica. Ken was also able to recruit an additional 3 friends to sign up for the event. So, on Friday, July 17th, I met the others at a home we rented for the weekend, just 1.5 miles from the Northstar Village. Athletes registered and attended a mandatory race briefing Friday evening. I didn’t know much about this event other than it was going to be long. At the briefing, I realized just how big a deal this race was. I learned that it was the last qualifier for the Leadville 100(mile) race in Colorado taking place four weeks later. I’d always wanted to do Leadville and was curious if I could qualify. On race morning we all got up slightly after 5am. Each did our morning pre-race routine and ate steel cut oatmeal with various fruits, nuts, and seeds mixed in. I mixed my bottles, grabbed GU gels, strapped on my Rudy Project sunglasses and helmet and was off to the start. It was an easy ride, mostly downhill and about 2 miles to the start. I wasn’t too concerned with warming up since I’d mostly be trying to survive the event knowing it would take me over 5 hours to finish. Considering this was quite a bit longer than my training rides and all the racing was above 5,900 feet elevation, I knew I had to keep my efforts in check. There were several corrals at the start and racers were expected to line up in the correct corral on the honor system. My buddies and I all lined up in the 2nd corral at the very back as we were thinking it might be a little fast for us but the next corral was certainly too slow. We settled in and listened to the National Anthem and some final instructions. There was a short countdown and we were off. Considering this was going to be a 5-hour plus race for all but 30 or so racers, the race started out really fast! This continued the entire 2ish miles to the dirt at the base of the ski run where the climbing began. At this point, things started to slow down a bit. However, my heart rate was in the mid-150’s which was way too high this early for such a long event. I wanted to get in a good position before we got to any single-track though. The worst think in mountain bike events is to get stuck behind slower riders on a long, technical single-track because it’s difficult to pass. About 90 seconds into the climb I made a move to the inside of a large group of riders. The terrain was very loose and off-camber here and I was taking a chance. I was able to keep my balance and the risk paid off. I got around 15 riders and now the racers were really starting to spread out. The first hill was already sorting things out. I checked my heart rate and settled into a pace that I thought I could continue for the next 60 miles. I was no longer concerned with any of the other racers. I was going to just race my race. About 8 miles into the race now, I noticed a professional woman racer just ahead of me. I remembered my buddy pointing her out at the start. I thought to myself that I probably shouldn’t pass her because she was certainly more experienced than me and she’d have a much better idea about the proper pace for the event. Regardless, I passed her at my earliest chance and slowly moved ahead. I had started the race with two water bottles and left a special needs bag with two more pre-mixed and some GU’s just in case, not knowing what to expect at the aid stations. The first aid station I noticed was at mile 16 (certainly, there must have been another earlier?). At first glance, I didn’t notice any food or drink so I continued riding. I noticed another first aid station at mile 21. Again, I didn’t notice any food or drink. Now I was a little worried. I was out of fluids and if I had to wait till the special needs bag at mile 33, that would be disastrous. I have a history of cramping badly at races at this elevation. The next 2 miles are on a slight downhill grade on a gravel road. I get in a tuck position and let gravity do its work. I’m steadily cruising at 27 – 32 mph. This is faster than the other riders as I’m able to pass 4 of them on this segment. Finally, at mile 24 I see food and drink at the aid station. I hand one of my bottles to a volunteer and ask him to fill it as I quickly grab a ¼ PB&J sandwich and some fig newton bars. I grab the bottle and I’m off. Looks like the last 3 riders I passed on the gravel descent were able to re-pass me. No worries, within 5 minutes I’ve gotten back ahead of them. At this point, I’m approaching the length of my long training rides. Sadly, I’m not even half way through the race. I quickly stop again at the aid station at mile 28 and notice the Pro woman rider I passed earlier has now repassed me. The next couple miles are a gradual climb and I nearly reel her in before its crest. We begin the downhill descent into Northstar Village and I’m able to pass her before the beginning of the 2nd lap. As I come into the beginning of the 2nd and final lap, I see the special needs bags. I jump off my bike and look for my things. ARRGGHHH!!! My bag isn’t where it should be. I yell out to a volunteer that I can’t find my bag. They tell me that the numbers fell off some of the bags and those bags are at the far end. So, after about 90 seconds of searching, I finally locate my things. I take off my arm warmers, leg warmers and also my base layer shirt. By the time I finish all this and grab my pre-mixed bottles, I’ve lost close to 5 minutes. I jump back on my bike and start climbing the ski run for the second time. My plan at the special needs stop was to also take a moment and re-lube my chain, but in the panic of trying to locate my things I had forgotten. The terrain was sooo dusty the chain was now bone dry. I didn’t want to risk having a mechanical issue over the final 31 miles so I quickly stopped and re-lubed and was off again. Now I’m wondering how many of those racers that I worked so hard to pass over the previous 45 minutes have now repassed me??? Oh well, I’m not going to let that worry me. I decide to just settle in again and ride a pace that will get me to the finish without blowing up. To entertain myself, I start counting each position I gain. Whereas the first time climbing the ski run I pedaled though, this time I jumped off my bike for a particularly steep part and power hiked. There was no sense digging so deep knowing what I was up against. Even though I walked, I didn’t lose much ground to the riders ahead of me. I continued to push hard through the second loop. It seemed like I was a little slower on the climbs but having been through the loop once already, I was considerably quicker on the downhill portions and technical rollers. Somewhere about 8 miles to the finish and a couple miles before the next aid station I run out of fluids. To this point I haven’t had any cramping issues but now I’m worried. I’m able to get make it to the stop to refill the bottle and finally, a few minutes later, I can feel my quads starting to cramp. I ease up slightly hoping to give the muscles enough of a break to delay a full onset and within 10 minutes the little cramping I’m experiencing subsides. Looks like I made it to the aid station just in time! By the end of the race, I was able to count 43 riders that I passed on the loop and 1 passed me. So, I was able to move up 42 positions after my special needs stop. Super happy with that! I must have paced myself much better on the first loop than most others. I end up finishing with a time of 5:20:26. This is considerably longer than any training-ride I’d done all year and at an intensity I didn’t think was possible for 5+ hours. I’m extremely happy with my effort and result. I placed 32nd of 157 in my age group and 67th of 386 overall. This race was a qualifier for the Leadville 100 which is on my bucket list. There are 18 golden tokens (entries) available to my age group and with the roll down, my name (and two of my buddy’s) is called. The token could be used for either 2015 (exactly 4 weeks away) or 2016. None of us would have been ready to do the event in 2015 since it would take us approximately 10 hours to complete if physically fit to race it. We decide to pass on the tokens. We figure that we qualified this year when none of us trained as well as we could have, so if we wanted to race Leadville in 2016, we would most likely qualify if we race the Lake Tahoe Trail 100k next year.